Luna has a home! 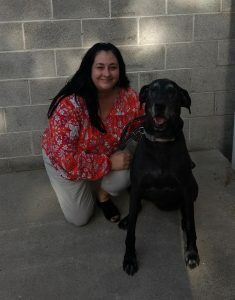 - Rocky Mountain Great Dane Rescue, Inc.
Luna has a home with her Foster Mom, April, in Utah! April has adopted from us before, and didn’t hesitate to step up when Luna needed a foster home. Luna is a very special girl in that she is not very fond of other dogs, and needed slow introductions when meeting new people. With patience, and dedication, April dug in and worked with Luna, along with a trainer, to provide her with a home she could flourish in! At seven years young, Luna has plenty of energy, so she keeps April busy with lots of play time and long walks. With her being the only dog, Luna is enjoying all the attention and love that April has to give! We are so excited for both Luna and April! Way to go sweet girl!